This is the first of several postings on quick, simple, tasty, and reasonably healthy meals. A “short order cook” means someone who cooks many meals at the same time, each one taking very little effort or attention. Things like putting a basket of already floured chicken into a deep fat fryer while at the same time laying a steak on the grill, while at the same time putting some 1/2 cooked noodles prepared in advance into hot water to finish. Then having them all come up on the pick-up window at the same time. All inside 10 minutes. This is NOT being a fancy chef. There isn’t a lot of fancy sauces. Complicated processes are avoided. Long ingredient lists and rare or unusual ingredients are avoided. Just plain old cooking. With that preamble out of the way, here’s a few easy meals I’ve made many times and showed to my friend who doesn’t like to cook, but wants to eat! This uses a “rice cooker” with a steamer basket in the top. You can do this with regular pots and steamer baskets, but at all of $15 to $20 for an automatic rice cooker, why? Put cup (or scoop) of rice in the bottom. For white rice add 2 cups (or scoops) of water. For brown rice add 2 2/3 cups (or scoops) of water. That’s it for the rice. Take a salmon filet of the size you like, and lay it in the steamer tray. Pour vegetable mix in the tray next to it. (I typically use a frozen mix of carrots, broccoli, pea pods, whatever). For white rice, place the tray on top, close the cooker and turn it on. Come back in about 25 minutes when it is done. For brown rice, close the cooker with only the rice in it. Turn it on. In 20 to 25 minutes, come back and open it, put the steamer tray in place, close it. Come back at about the 45 minute mark when it is done. I’ve used fresh or frozen fish steaks. For frozen put it in 20 minutes after starting so it gets 5 extra minutes to defrost, for fresh, I put it in 25 minutes after the start. Change-ups: (These are ways you can change the meal). Most fish steaks or fillets will work. Watch out for thin very tender fish like Dover Sole as it will tend to fall apart when you try to take it out of the basket. Thicker fish works better. A mix of 1/2 lentils and 1/2 rice (brown or white) makes for a nice pilaf and the rice cooker works just fine. For this one, I used Turkey Thighs but any cut of bird that’s big enough to take an hour to roast would be fine. I’ve even used a whole chicken. I just like the taste of dark meat better. Take a cookie sheet. Lay the amount of turkey thighs, chicken thighs, legs or whatever on it that you want to eat. For leftovers, add some more. (They come in handy for the Chef’s Salad below, for sandwiches, or for the Fried Rice). Place the tray in a medium oven for about an hour. What’s a medium oven? How fast you want it cooked?… Anywhere from about 300 F to 375 F works (150 C – 190 C), just the speed changes and how brown the thin bits get like wing tips. I typically use 350 F / 175 C. Bigger chunks will take closer to 1 hour and 15 minutes (like a large whole chicken) while wings are faster. IF you cook small parts and the squash isn’t quite done yet, put the chicken on a plate and the squash back in the oven. (Stick a fork in it and if it is soft and the fork goes in easily, the squash is done). For very thick bird parts, like Turkey Thighs, using a very sharp knife, cut to the bone and take a look. If the bone is pink or there’s blood visible, it needs longer; so set the squash on a plate and put the bird back in the oven. For acorn squash and thighs, they finish at about the same time. The reason for giving the “how to check” directions above is that how long it takes to cook depends on the size of the parts, the particular kind of squash (how thick it is), the starting temperature (room temp or from the fridge?) and your particular oven. In my friends convection oven, we had to use 45 minutes as they cook faster. Unless those variables are specified, anyone who says “cook exactly this long” is going to be wrong sometimes. So about 90% of the “time to done”, take a look at it. Does the bird LOOK done? Nicely brown with crisp skin? Is the squash fork soft? Remember that you lose about 5 minutes every time the oven is opened, but if it isn’t done, check again 10 minutes later. Once you know how long your oven takes with the bird parts you like, you can skip the checking early. Plating – I place the bird on a cutting board for big parts or whole birds and cut off meat to arrange on each plate. The squash is turned over and a large spoon used to scoop and scrape out the yellow meat of it. If you like, a bit of salt and butter can be added. Sometimes I’ll use brown sugar for a more desert like effect. Put scoops of it on the plate, make a depression in the middle with the back of the spoon, and add a dab of butter. A simple bag-o-salad side salad is a nice companion. That’s it. Takes longer to describe it than to do it. Carrot sticks about the size of your little finger can be piled on the cookie sheet / baking dish. Yams or sweet potatoes can be roasted by just putting them on the pan, rinsed, but whole. Poke some holes in them (any potato) so they don’t explode in the oven. They take about 45 minutes so you might need to put them on the pan after the bird has had 10 or 15 minutes of lead time in the oven. (Depends on how thick the sweet potato is – big ones take about an hour, little ones less. It doesn’t hurt if you are off by 10 or 15 minutes anyway). Almost any bird will do. I’ve used Cornish Game Hens for a high end effect. Duck is a bit too fatty to work well, though. Duck takes a different kind of cooking, though duck parts might work if some of the thick fat is removed. The bird can be “from the package” or various rubs and marinades can be used to change the flavor. One of my favorites is when I finish a jar of Bread And Butter Pickles, the liquid and spices in the jar are a great marinade. I’ll add about 25% soy sauce sometimes for a different flavor profile. Just let the chicken parts or turkey parts soak in it for anywhere from an hour or 2 on the counter, to overnight in the fridge. Small potatoes will bake in an hour if started from room temperature. Larger potatoes or those stored in the fridge will take about 1.25 hours so start them first, then add the rest. Sometimes I will “jump start” a large or cold baker in the microwave with 3 minutes on high, then put it on the tray and it all goes into the oven. For this, obviously, you need a slow cooker. I’ve used this “on the road” in a one person sized slow cooker. I’ve also made it sized for a family of 4 with lots of leftovers in a very large slow cooker. Keep the ratio of ingredients about the same and it’s fine. For the one person size, I used a Cornish game hen and either 1/2 can of soup or no soup at all. For a medium size, I’ll put 3 or 4 chicken thighs in the pot. I cut the meat off one, or both, sides of the bone so that the heat easily reaches the bone to cook it (otherwise sometimes it is a bit pink). OK, on top of this the typical thing to add is a can of Cream Of Mushroom or Cream Of Chicken condensed soup. Use a rubber spatula to get it all out of the can (or work a lot with a spoon ;-) There are “heart healthy” versions of this that use 1/2 salt 1/2 potassium chloride. DO NOT ADD THE CAN OF WATER. In theory, you can just be done now. I usually add about 2 shot glasses of water (60 ml or 2 ounces). Liquid cooks out of the chicken and vegetables to make a nice gravy. I usually end up with it a bit thin from the added water, but I think a spoon of water to make steam gets things going faster in the middle of the filling. Plug it in and turn it on. On low, it’s done in about 8 to 10 hours. On high, about 4 to 6. Sometimes at about the 2/3 point, I’ll use a big spoon to stir it and mix the ingredients / move the colder center to the hotter outside. That isn’t necessary, but it lets me feel like I’ve done something and “made it better” – even if mostly just a feel good thing. A Roux & bouillon cube can replace the “cream of soup”. Mix flour and butter to the consistency of a paste. About a tablespoon (varies with the size of your cooker but not critical). Number of bouillon cubes too. One for the personal sized, 2 for medium or to your preference. Mix the roux, add the crumbled cubes, add about 2 ounces hot water and stir into a slurry. Pour in spreading it around the pot. Sometimes I’ll add 1/2 a can of peas (or leftover peas). Various other vegetables can be added as you like it. Realized that things from the cabbage / kale family get strong flavors that can be unpleasant in slow cookers. Added garlic can make a more interesting meal for folks who like garlic ( I’m one ;-) but it too strengthens in the slow cooker, so moderation at first. Or add it at the end. For this, you need some roasted bird to cut into cubes. You can buy it at the deli section of your grocer, or just cook some extra in the roast bird meal above. Get a “bag-of-salad” of the kind you like. My spouse likes butter lettuce, I like mixed iceberg with vegetables (carrot bits, purple cabbage strips, radish slices). It doesn’t matter much as long as it has a lot of lettuce. You also need to have some hard boiled eggs you made in advance. Hard boiled eggs are one of those “regular things” to keep in the fridge. When I shop each week, I buy eggs. The old eggs that didn’t get used the prior week get boiled. Older eggs don’t have the shells stick when boiled. ( 10 minutes at the boil, then 12 minutes in ice water to avoid dark rings on your eggs). I also always keep a package of “sandwich ham slices” in the fridge. It’s also possible to use left over ham steaks or baked ham, but we get to those meals in a future posting. For now, a couple of slices of sandwich ham it is. Assembly is trivial once you have “the stuff” on hand. Pour the bag-o-salad you want on the plate. Peel and halve the egg. Place the two halves on opposite sides of the plate. Roll or fold the sandwich slices into a smaller shape and cut into bits the size you like (about the size of a thumb nail is nice). Place it on one side between the egg halves. Take some left over bird and cube it (about the same amount as the ham) and place it on the side opposite. From a bag of shredded cheese (another always-in-the-fridge item) take a grab of cheese shreds and plop them in the middle. Spoon a few olives round between the cheese and the meat / eggs. Pour on the dressing of your choice ( I like ranch or blue cheese ). That’s it. Serve and eat! Add some crackers around the edge of the salad, or croutons work too. I’ve used avocado slices instead of the eggs, or in addition. Depends on what’s on hand. The cheese can be any cheese you like (or none at all). Blue cheese crumbles, cheddar chunks. A miniature Gouda round cut into wedges. Monterrey Jack cubes or strips. Etc. This one is the most complicated in some ways, but still easy. Some of the best foods in the world are based on “left overs”. This is one of them. It is, in essence, Chinese Leftovers. That’s part of why it comes in so many varieties. First off, it works best with day old rice from the fridge. So you need to either make that ahead, or have lots left over from the simple steamed salmon meal above. Second, you will be putting a “protein” into it. This is a ‘left over’ so already cooked or you can use a canned meat. I’ve made this with SPAM and it’s good. I’ve also used canned shrimp. This is another one where some leftover baked chicken from above is handy. I like making this in a wok. I’ve used electric or simple steel over heat. I’ve also used an electric skillet and a large stainless steel chefs pan on the stove. It does need room, so some wide big pan. Coat the bottom with oil ( I use olive oil) about 1/8 inch or 2 mm deep. Start it warming up on a medium heat. I then chop up an onion. How much? How much old rice to you have? I use about 1/4 to 1/3 the volume of rice for the onions, and celery. Chop to the size you like, smaller cooks faster, larger is non-traditional but I like chunky. I will then scrape a carrot and using a potato peeler, slice off thin wafers of that into the mix. Stir as needed to prevent burning. About now I’ll turn it up to a little higher to assure some caramelization happens. As the onions get translucent and some caramelization starts to form, be chopping up your “leftover” meat. Add it and stir.Y ou need to add some other vegetables too. I’ve used yellow summer squash in thin sticks or small cubes, leftover peas, broccoli, sugar or snow peas, even pre-packaged stir fry vegetable mix. You can used bean sprouts if you have them. Dump the old rice on top and break it up into a smooth layer (it warms from the steam of the cooking vegetables). Then stir it in. Finally, of course, add something from the cabbage family. I just use a few leaves or a chunk from regular cabbage heads (traditional is a “choy” like bok choy) cut into shreds; but Napa Cabbage works nicely too. Stir that all together and keep it moving enough to prevent burning. Now it’s time to add some flavor. I’ll drizzle over the whole thing some soy sauce. This also makes some steam to help cook the greens and it de-glazes the pan a bit. There’s a spice sold just about everywhere called “Chinese 5 Spice” a bit about the size of your little finger tip gets dusted over the top and it all gets mixed in. Change-ups? The whole thing is a change up. Use canned shrimp if you like, or SPAM slivers, or leftover chicken in small cubes or pork shreds, or “whatever”! This entry was posted in cooking, Food and tagged Chicken, cooking, food, Roasted, Salad, Steamed, turkey. Bookmark the permalink. By the way the rule of thumb on rice that it takes 2x the water as the volume of dry rice needs to be tweaked slightly at high altitude. This is due to the lower boiling point of water at altitude (cooler cooking temp) and dry air (low humidity. I use a 3 oz scoop for rice, single serving one 3 oz scoop, two servings 2 scoops. To that 6 ounces of rice I will ad about 14 ounces of water, let it cook down until there is almost no water in the bottom of the pan and set off the heat to rest for a few minutes covered while I prepare the rest of the stuff that goes with it. E.M.: I use toasted sesame oil (black sesame oil) for fried rice. Yum! Garlic, onion, ginger, sesame, and soy; the five pillars of Chinese cooking. Nice post! That right there is some good solid Cooking 101 stuff. Also you mentioned your FF likes to grill; if he ever runs across Thresher shark steaks, have him snag a couple. Best grilling fish that I have run across so far. Grilling is the only way I have fixed thresher shark, so I have no clue how it is when baked, fried, or steamed. I don’t mind, and I know you don’t mind, but if your FF doesn’t like the chopping, slicing, and dicing it can be done in one session. My wife can’t slice and dice any more since her left side is compromised from the stroke. So I do this with green and/or red peppers, red onions, cucumbers, and celery for salad makings so they are ready to assemble. Have a chopping session and cut those items the way you like them, size and shape-wise. Then put each item in a sandwich baggie with a folded paper towel (two for the cucumber or you will get mush), and squeeze out the air. I’ve found that they all keep for about a week that way, unless you use them up in a few days. The cucumber is the only item that doesn’t last too long, so I only cut up a third or a half of a cucumber and seal the end of the uncut portion for another go. OTOH, it sounds like your FF may not mind a little slicing and dicing, but I still find that once I’m in salad prep mode, might as well do the whole veggie and bag it. Many years ago (late 60s) we would leave work on a Friday and drive about 3 hours to a favorite trout stream in NE Iowa. Tucked alongside the vehicle’s engine would be an aluminum foil wrapped multi-component meal. Because things cook at different rates, the “parts” have to be cut and layered accordingly. Once this cooking method is learned, at your destination the meal is properly ready. Haven’t done that in awhile. Good point! All my cooking is basically sea level, so I’m not used to thinking high altitude. I also neglected peppers as the spouse is unfond of them. but they work well too. FF says thanks for the tip on Threshers! I told him he can buy pre-chopped, frozen, chop to order or make bags of pre-chopped, so up to him. Can’t say that I have much to add to the above. Cooking is no chore at all Just creative fun. Super! Anything to make it easier to stick with the change in meals until they become routine. And who knows? Maybe he’ll catch the amateur chef bug once he has some skilz and meal ideas. Per Thresher shark: I watch the odd fishing video or two or three, or three hundred 😜 and one was on some Texas guys who were fishing for Thresher sharks for the freezer. They were shooting for ~100-pounders because the steaks were the right size and the flavor was better than the larger ones. Anyhow, there was something about seasons and limits, so they made the video because it wasn’t an every day fishing event. I’ve only run across Thresher shark steaks twice in the fish markets and both times I bought some. Never regretted it. They hold together on the grill and have a great flavor, texture, and assuming you don’t overcook them, or any fish for that matter, they stay moist. @p.g. : Cooking is a creative outlet for me. I’ve always maintained that I’m so bad as an artist, I couldn’t draw Social Security. Yeah, that bad. (6 – 8 ounces of dry rice, plus 2x the water) While that is cooking. Optional 2 slices of bacon cooked and chopped. decant sauce mix into a refrigerator container. To prepare – mix the preferred amount of rice with the sauce until you get the rice thoroughly coated with the sauce, with only a little free liquid, then heat in fry pan for a couple minutes turning constantly to keep it from burning. Make final adjustments to spices as you heat in the fry pan. Reheats well in microwave if put in zip lock bags and shaped into a flat about 3/4 inch thick. Quick Macaroni and Cheese casserole with tomatoes. 1 1/3 cup dry macaroni, pour Macaroni in boiling water (takes about 12 min to cook) Stir immediately after added to the water to keep it from sticking together, and periodically until done. Put dish in microwave and nuke until the cheese melts, stir the cheese into the tomato mix. When Macaroni is cooked drain well and pour into casserole dish and stir in the combined ingredients, (salt to taste while mixing it together ) top with 3 – 4 slices of cheese and slap it back in the microwave for 2 minutes or until the top cheese slices start to melt. I know you are trying to limit carbs probably but these are some of my go to dishes when really hungry and not interested in working too hard to make filling meal. You nailed it EM . Caesar Salad is a goodie too, Easy one,..
and a good dash of Caesar salad dressing. Voila! While this particular set was somewhat carb limiting (staying with small quantities of brown rice and rice / lentil mix) the plan is to cover some full starch simple meals too. Eventually. So no worries on comments with other styles. Many different folks with different interests will read this. 8 oz can of oysters. 8 ounces milk. Pat of butter. Grind of pepper. Salt to taste. Into a sauce pan put the pat of butter. Open the can of oysters and dump it, juice and all, into the pan. Put a grind of pepper on top. Turn the burner on high. Now fill the can with milk and set it aside for a little while. As soon as the oysters start to simmer (bubbles around the edges and starting to spread inward) turn it down to a medium heat and dump in the milk. (Toss out the empty can). Stir it a bit from time to time as it warms. When it returns to that simmer around the edges, set it off the heat. Pour or ladle into a bowl and add saltine crackers. Adjust salt AFTER you add crackers as they add salt. Sometimes I add a little onion or garlic granules. I’ve been known to add some cooked peas, but liked it a LOT more than peas back when I could eat corn and added a bit of canned corn for a corn and oyster chowder… If out of crackers, floating bits of bread and bead crust in it can be very nice. My easy but novel snack uses spam and ready roll puff pastry. I cut the spam into mouthfulls, which might be one, two or three bites but not a bite and a half. Round each bite I wrap a strip of pastry. I prefer a high filling to pastry ratio so the strips don’t cover all the spam and are more of a pastry belt than a jacket. That way when you bite, you sink your teeth into just spam and don’t leave pastry crumbs. Oven cook on the non stick paper that came with the pastry till it’s the colour you want – the filling is cooked so no need to be fussy about under cooking it. Best sausage rolls I’ve ever had. Good with salad or veg or on their own. One of my favorite “easy” meals is stir fry. I just season some meat (chicken chunks is good), fry it up in oil until just cooked and set aside. Then, grab every vegetable you have in your fridge and fry them up starting with the hardest ones first. The flavor can be simple like soy and ginger and garlic or just buy some Asian sauce in a jar. Serve with egg noodles, Ramen noodles or rice. It’s a great way to “reset” your fresh vegetable collection. That puff pastry idea made me want to look up puff pastry. The first recipe includes bacon, and there are many others that don’t, but looks like a good resource. I do “make ahead” lunches for the spouse. She puts one in an insulated lunch pouch / bucket and warms it at work. I like to use a ceramic Corning bowl with a tough rubber like white plastic lid. It does not discolor, pit, or absorb colors like the plastic tubs; but… it costs a lot each (about $10 to $14 last time I bought one, but that was years and years ago… they last almost forever). Well, why mention it? After all, I usually just put the “leftovers” from main meals into them? Well, I’ve made a package of Betty Crocker Au Gratin Potatoes ( Per package directions: Put 2 cups of water on the stove to the boil, put a spoon of butter in a casserole dish, add 1/2 cup milk, when the water boils add it; sprinkle in the season/sauce package and stir with a fork or whisk. When mixed, dump in the dried potatoes and put it in the oven. 25 Min. at 425 F ). As a “changeup” sometimes I add an ounce or two of chopped ham or SPAM, but this one is headed for a Friday meal. At the same time I was reminded of the “Loaded Baked Potato”. Having a bag of big baker potatoes that were left to sit for 2 weeks while I was gone, and it needing a while to get through a 10 lb bag anyway, it would be good to get some of them moved along too. So I’ve put two big ones in the oven. Now the regular dinner Loaded Baked Potato just comes out of the oven, gets opened, and “stuff” piled on top. Usually an olive or two, some chopped ham (leftover baked ham or a sandwich slice chopped to bits – or even SPAM if I discover we’re out of ham at plating time ;-) and butter or cheese or both as you like it. To turn this into a lunch bucket I just spoon the spuds insides into the bowl, add the ham and cheese shreds, and stir. Then top with a bit of butter and an olive or two if desired. Sometimes I’ll have that be the whole bowl. Sometimes it is about 2/3 the bowl and a vegetable goes in the rest. To bake a spud is nearly zero time to prep. Buy big Russet potatoes for baking. They are worth it. With a scrubby, lightly scrub the surface under running warm water (warm just because I don’t like cold hands ;-) then put it on the counter. Turn the oven on to a medium heat ( 350 F or 200 C). With a fork, poke the spud a couple of times on each side (so it won’t explode from steam in the oven) and put it in the oven on the wire rack. Come back in about an hour and 15 minutes. Grab with a potholder and if rock hard, leave it for another 10 minutes. If it “gives” and is soft, it’s done, take it out. I’d give it maybe a minute to wash, poke, and put in the oven for 2 to 4 big spuds. When it’s done, roll it gently on the counter (remember your potholder) to gently break up the insides. Then slice it open lengthwise, put on a plate, score the surface with a knife if the surface is not broken up by the rolling. Add butter on top spread around, drop on a grab or two of shredded cheese and then any chopped meat bits or olives or whatever you like to load it up! I’ve used “bacon-bits” from commercial packages, SPAM, chopped left over chicken or turkey bits. All sorts of choices. That plating step is about a minute too. Yes, you get to wait for the oven baking time, but the actual you-involved cooking time is about 2 minutes total. For a 1/2 hour baker, put the spuds in the microwave for about 3 minutes before moving them to the oven. Less time for one smaller spud. Then they “finish” in the regular oven in about 25 to 30 minutes. Fast yet still has that real oven baked flavor and texture. For a NOW option: Poke the spuds, put them in the microwave for 3 minutes. Turn them over and microwave again for 3 more minutes. At that point you have a done spud. Proceed as above for plating. Note that really big potatoes often have an under cooked core in the microwave. The microwaves just have trouble reaching 2 inches into a 4 inch big spud. I’ll use medium or even smaller spuds for the microwave ( 2 smaller ones instead of one big one per person). I’ve known about steamed Asian chicken dishes before, but I’d not tried it. I’m just too fond of roasted and / or fried ;-) But today I decided to give it a try. For this first attempt, I didn’t put a lot of attention on the flavor profile. I wanted to see what it was like “plain” so I could know how the base tasted prior to adding more flavors. It was very nice, but a bit mild. So “what is it?” I took 3 chicken thighs and removed the skins. ( The dogs thanked me for the kibbled lightly fried chicken skins ;-) Then I cut each thigh into 3 parts. Just running the knife just outside of the bone width. This gives two “all meat” chunks and one “bone with meat”. They cook more evenly that way. These were just placed in the steamer tray, leaving a few of the vents open and uncovered. Into the rice cooking pan I put one big package of yellow saffron rice. Just the commercial product. Per package directions, I added 2 1/2 cups of water and 2 Tbs of olive oil (optional). Put the steamer basket on top, and turned it on. About 25 minutes later I had a very nice saffron rice bed with chicken chunks on top. The flavor profile is nice, but mild. I think it would be more tasty with a soy marinade or with a pickle juice marinade. One could also use a spice rub or even a simple vinaigrette marinade. That said, I’d be happy to eat it plain any day. The chicken is remarkably soft, tender, and juicy while being cooked through. I’ll be doing more of this! I’m also now quite sure that a Cajun style dinner could be made with packaged “Red Beans & Rice” in the bottom and hot spice treated chicken or shrimp or crawdads in the top. Similarly a commercial Spanish Rice mix with a Mexican spiced chicken in the top also ought to be a nice variation. The key takeaway here being that it’s fine to cook chicken in the top of the rice cooker. I would keep pieces appropriately small. I suspect that a whole thigh or a full chicken breast might not be fully cooked in the middle. That assumption ought to be tested, and if true, would mean larger parts were fine with the longer cooking of brown rice. Similarly, one could add some pearl onions, large onion slices or pepper slices to the top layer to add variety and color. Kind of a steamed fajitas sort of dish. Hmmm gives me some ideas on a variation of my normal rice dishes. I being single tend to go with small portion canned meats when I can get one that works. For chicken I use these. Will have to plop some chicken in the top of a batch of rice and see how it works, would be fast and trouble free if I can work out the right sauce. Some chicken broth thickened would be a good start for a sauce, add a bit of soy sauce and such, basically could be prepared in the time it takes to cook the rice. I buy packaged bulk chicken thighs and rebag them into individual (or dual) sized plastic sandwich or quart freezer bags or plastic tubs and freeze them. Then I can get 1, 2 or more pieces as desired. When I want to cook some, I set it in the fridge the night before and it’s just there all defrosted the next day for cooking. I’ve got one of the rice cookers with a steamer basket and it worked best, but some years ago I made the same basic dish in a rice cooker without the steamer basket. Just put the chicken in with the rice. There’s a “simmering” stage as the water comes to a boil and I didn’t know if that was needed to cook the chicken or if steaming was enough. Looks like both work. So in reality this particular dish (steamed chicken over saffron rice) is really a refinement of that earlier dish. FWIW, if I forget to do the defrost, a few minutes in luke-warm water and the parts are defrosted enough that a strong knife can still cut the semi-defrosted meat wedges off the central bone chunk; and the rice cooker only finishes when all the water evaporates so seems to adjust cooking time for the colder starting condition automagically. Oh, and while I’ve not tried this with Turkey, it ought to work just the same but with a different flavor. I got around to playing with those cans of Chicken I mentioned above (5 oz chunk chicken), I emptied one of those cans into an 8 oz back packing cup (stainless steel) with out draining it. Added an equal volume of water (refilled the can one time), a few spices etc. Added just a bit of water to get the right consistency and to pre-dissolve the corn starch. It made enough sauce w/ chicken to cover two good sized servings of rice. Not bad, I will have to fiddle with some other veggies like celery slices, carrot bits etc. but a good back pack or survival cache dish that basically all you need to fix is 3 – 6 ounces of dry rice, and one can of the chunk chicken and a bit of water plus a few spices. and you can feed two people a good filling meal. I have made home canned chicken experimentally. It is a bit over cooked as the recipes are over paranoid compared with the commercial product. On my someday list is a pH food meter and canning pH Nomograph so I can make a better product. Until then buying the commercial flat cans is cheap and easy. I’d can my own if I grew or shot my own meat, but only after the freezer was full ;-) For excess red meat, I’d make jerky or corned beef canned. Peel & dice about a can worth (or 2 if meat is scarcer) of potatoes into dice about 1/4 inch on a side. Brown in a skillet in some butter or other animal fat (saved beef tallow is great for this). When getting glossy through, add a can of corned beef, crumbled or sliced (it will crumble, on stirring, for thin slices.) Stir every couple of minutes as the beef browns. Plate a spatula / shovel full or two and a pile of boiled cabbage next to it. Yum! @E.M.: I can see that canned corned beef recipe as being even easier and faster as a ” from the emergency canned rations” meal. Used canned, diced or sliced potatoes. I’m not sure what the use-by dates are on canned potatoes, but I’d guess they’s be 3-4 years out. OK. I’m back. It seems that 5 years is a good number and someone on a survival blog mentioned in a 2008 comment that he was eating DAK tinned ham from his 1998 Y2K disaster stash. Yeah, canned potatoes would work… but then just buy “Canned hash”… already assembled… just fry it up a bit for flavor… (Though the potatoes in it are overcooked as the meat needs a long canning time). FWIW, canned foods are good for a year, OK for 2, good enough I guess for 3-4, and losing enough flavor to be less than desired at 5+. IF stored in heat, all those become dramatically shorter. IF stored in cold, lengthened to decades. Eventually the lining of the can will start to break down and you can get corrosion (especially in acidic things) and then you have real risks beyond just low flavor and crummy texture and low nutrients remaining. FWIW, I recently found an MRE that had been in storage in the “go bag” in the trunk of a car for way too many years. Somewhere over a decade+. Some bits (the “cookie”) were not bad. Other bits (“stew” main course) were beyond my ability to swallow… Were I starving I likely could, but…. The “cheese spread” had turned into something solid floating in oil bits and was rapidly put in the trash. The cracker had a bit of ‘off / rancid’ smell, but not enough to be problematic and taste, while bland, was tolerable. My “takeaway” was that at 2 to 5 years it was likely fine to OK, but beyond that, it’s increasingly not beneficial anymore, with oils going off first and starches / sugars last. Proteins somewhere in between. So now I just plan on rotating my stock of canned goods at least once every 2 years and preferably in under a year. Dry goods like sugar & salt are permanent. Those like noodles and lentils and white rice seem good for 1/2 decade to a decade (some 16 year old lentils were a bit oxidized / browned but they have enough tannins in them to take it and were quite edible). 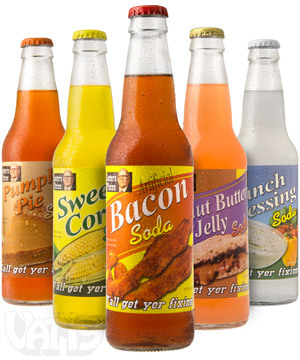 I have a bottle of Bacon soda with maple syrup on my kitchen counter as I write. I enjoyed your brief description of growing up in a family owned restaurant. I had a similar experience growing up in a small family owned bakery/deli. We worked hard, but we were together as a family, and I have many good memories from that time.